Have you seen a Grass snake in Scotland? Please fill in our simple online recording form and help us learn the distribution of Scotland’s largest terrestrial reptile. 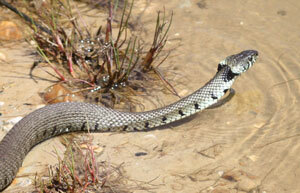 Until 2010, it was generally believed that wild grass snakes (Natrix helvetica) do not occur in Scotland. However, three confirmed records were made in Dumfries & Galloway between 2009 and 2010, and there are other unconfirmed but possible records from elsewhere in Scotland. Research has since shown that grass snakes are present in Scotland, but we do not know if they are recent arrivals or their current range. Grass snakes are charismatic, but shy animals, but may be seen particularly in areas with water bodies where they can hunt amphibians. Although harmless, they are the UK’s largest snake (females may grow longer than 1 metre) and can be easily identified by the pale neck collar. Cathrine, C. 2012. Scottish Grass Snake Distribution Research Poster. Herp Workers' Meeting 2012. Your records will also populate the ARG UK Record Pool database. Use this form to let us know about your Grass snake sightings in Scotland, and any other reptiles you have seen. If you have amphibian records or have seen Grass snakes elsewhere in the UK, please tell us about them at the ARG UK Record Pool. This section refers to the area where you save the Grass snakes or other reptiles. You can leave any questions you are unsure about blank.